Bob Strong is Professor of Finance and University Foundation Professor of Investment Education at the University of Maine. He has been a visiting Professor of Finance at the Maine Maritime Academy as well as Harvard University where he was Deputy Director of the Summer Economics Program from 1997 – 1999. Professor Strong’s three textbooks on Portfolio Management, Investments, and Derivatives are used at over 100 universities. He has been a conference speaker for the American Stock Exchange, the Chicago Board Options Exchange, and the Chicago Board of Trade. 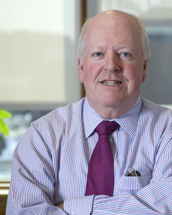 He serves on the Board of Directors of Bangor Savings Bank and the Sewall Company and is a past president of the Northeast Business and Economics Association and the Maine CFA Society. The University of Maine Alumni Association named Professor Strong the 2005 Distinguished Maine Professor. The Carnegie Foundation named him the 2007 Maine Professor of the Year. Professor Strong has served as an expert witness and consultant in a variety of investment-related areas including business valuation, investment suitability, and risk management with respect to derivative products. His past client list is wide-ranging and includes Maine & Maritimes Corporation, Quabaug Corporation, Bangor Hydro Electric Company, Cadillac Mountain Sports, Footwear Industries of America, the Maine State Police, and the Maine State Gambling Control Board, among others.